Molly Drummond is cursed: whenever a dog barks, she turns into a hare -- which can make life quite dangerous...So she does the sensible thing and attends a curse-lifting workshop, run by a local witch. She tumbles into a world of magical beings, all desperate to reverse their curses. But will the power that feeds on the curses prevent them from returning to their normal lives? 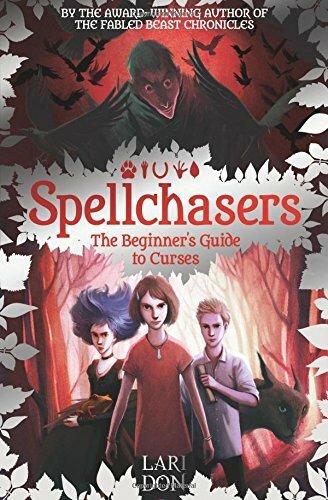 By the author of the bestselling Fabled Beasts Chronicles series, this is the dramatic first instalment in the brand new, long-awaited Spellchasers trilogy. This is the start of a new spirited adventure series which has been born out of Lari Don's great love of storytelling. There will be three books, all connected to make one giant Scottish ride of magical fantasy, that you will not want to miss. The follow up books will be: The Shapeshifter's Guide to Running Away (Book 2) which will be scheduled to be published in spring 2017 and The Witch's Guide to Magical Combat (Book 3) which will hopefully be published in the autumn of 2017. In the first book you will learn a valuable lesson not to annoy your neighbours as you are likely to get cursed in the process. Unfortunately this curse is not the easiest of things to lift and so, like Molly, you might need to undertake a CURSE-LIFTING WORKSHOP. There's no need to panic though, as in chapter 2 you take a visit to Skene Main's shop where you can enrol in one. On slight draw back is that you have to be between the ages of 11 and 21 years old. Nevertheless the course has guaranteed results and they also sell great organic vegetables! The potatoes are to die for, but you have to dig them up yourself. You will hurtle into a brilliantly created world of Scottish myth folklore and fantastic wild outdoors. This is a captivating adventure for the young at heart which will enchant the socks off any magical beings through its mystery, dark danger, humour and riddles. The book includes some really great character friendships, regardless of their backgrounds, and will make you feel warm at heart. The story is a fast paced, family read which will leave you breathless as you chase headlong into danger through a race against time. You will encounter some deadly pecking crows, sleeping trapped wyrms and nettle knickers, do I need to say more....? !